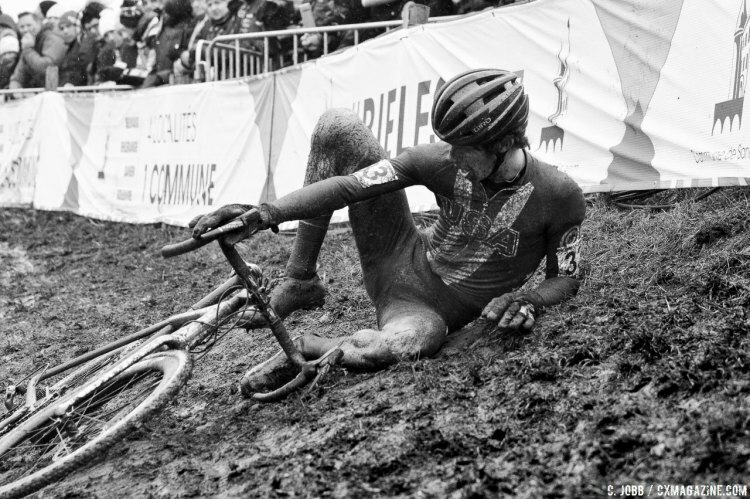 Slightly higher temperatures on Sunday and some overnight rain turned Saturday’s snow and ice at Bieles into “proper” European mud conditions. 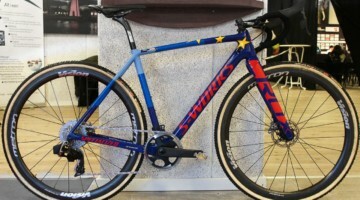 The numerous slick technical features meant bike handling and keeping the bike upright were at a premium in the Men’s U23 World Championship race. Conditions on a cyclocross course during a multi-day event such as the World Championship often change from day to day, making the course on Sunday completely different from the one on Saturday. 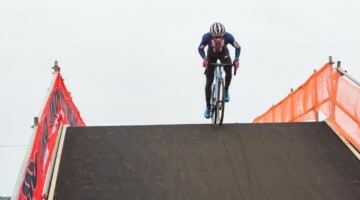 Saturday some of the snow and ice began to turn into mud, but overnight rain and Sunday temperatures around 38 degrees turned everything into mud and the track resembled traditional January cyclocross conditions. 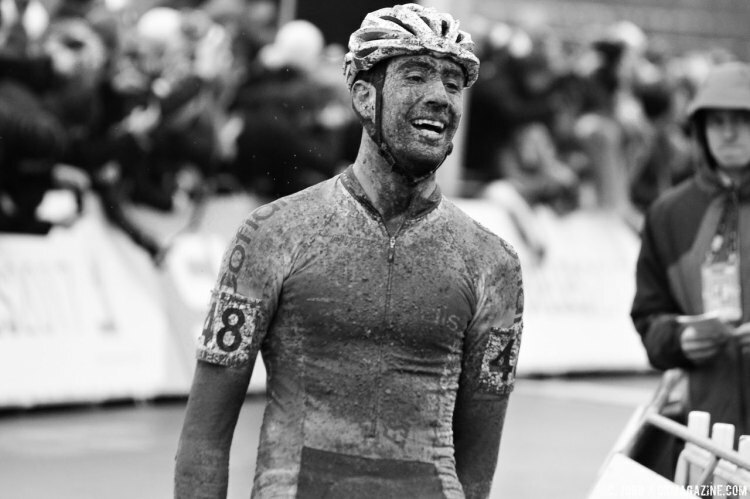 The greatest hits of technical features were all still there, but now with 150% more mud. 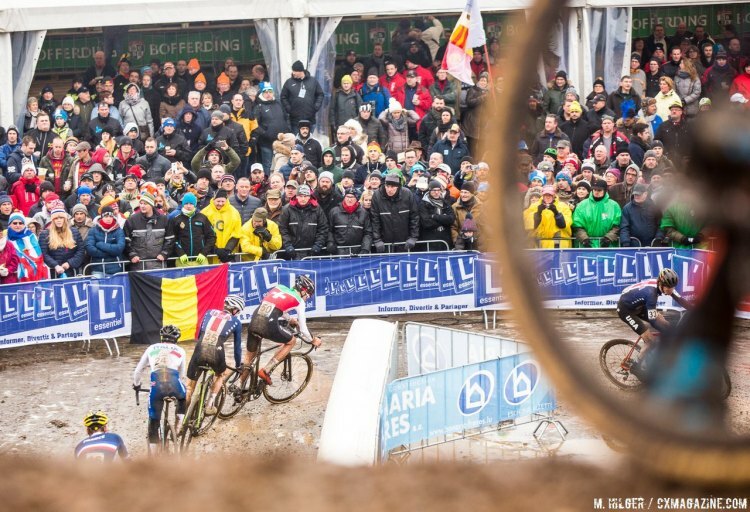 The steep drop-off where Annemarie Worst made her World Championship move in the Women’s U23 race, the sidehill off-camber where Sanne Cant realized her World Championship dream in the Women’s Elite race, the Hoogerheide-inspired stairs, and the Mt. Krumpit-inspired sidehill switchback off-camber. With the mud and technical features, Nieuwenhuis was on point—the key for Sunday success was to keep the bike upright and minimize mistakes. Joris Nieuwenhuis (Netherlands) wasted no time putting pressure on his rivals by opening up a large gap in the first lap. 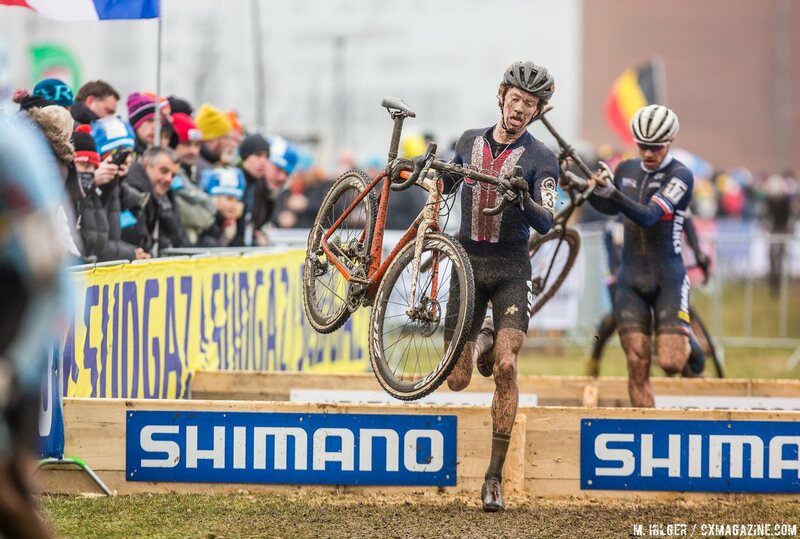 While the chase group struggled with mistakes on the technical, muddy course, Nieuwenhuis stayed near perfect and rode his own race to win the Men’s U23 rainbow jersey in emphatic fashion. Nieuwenhuis blasted out to an early lead off the front of a large group, joined only by former Junior World Champ Simon Andreassen (Denmark). Andreassen couldn’t hold Nieuwenhuis’ pace, and after the first lap the young Dutchman surged to a 15-second lead over second place. While riders in the chase group struggled with mistakes, Nieuwenhuis rode his own race, which it turns out, was very fast. He extended his lead by 20 seconds in Lap 2, and by the midpoint of the race, his gap was a minute back to the nearest rider. With every single lap, he stretched out his lead until the final lap, when he celebrated and made sure he arrived at the finish safely. Sunday’s script probably read like a movie cyclocross fans have seen before: a dominant Dutch rider gone off the front while other riders battle to be Best of the Rest. 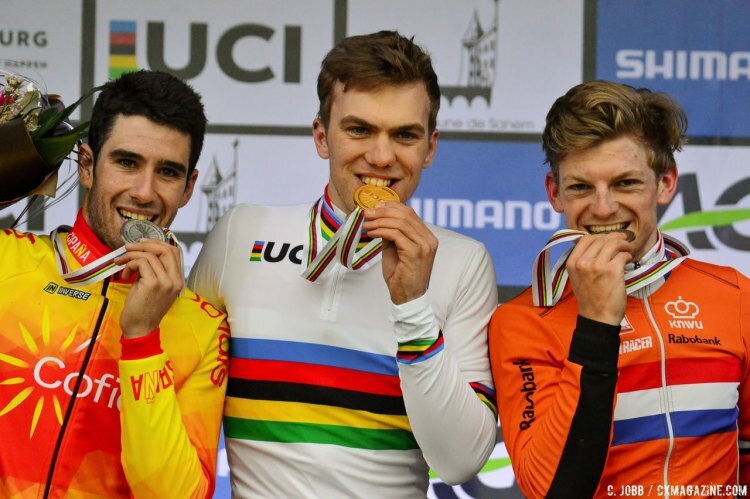 Defending World Champion Eli Iserbyt (Belgium) had a rough go in his effort to keep the rainbow stripes. After not being able to mirror Nieuwenhuis’ fast start, he had a disastrous second lap that took him out of medal contention. Iserbyt was in the chase group midway through the second lap, but then crashed at the bottom of the first descent, the Worst Descent, if you will. 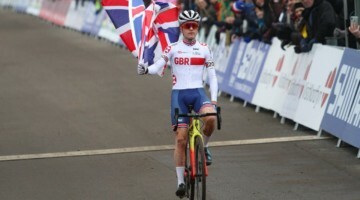 He lost his spot at the front, and then later skidded out on another slick corner to effectively end his podium dreams. He would finish in 17th place. 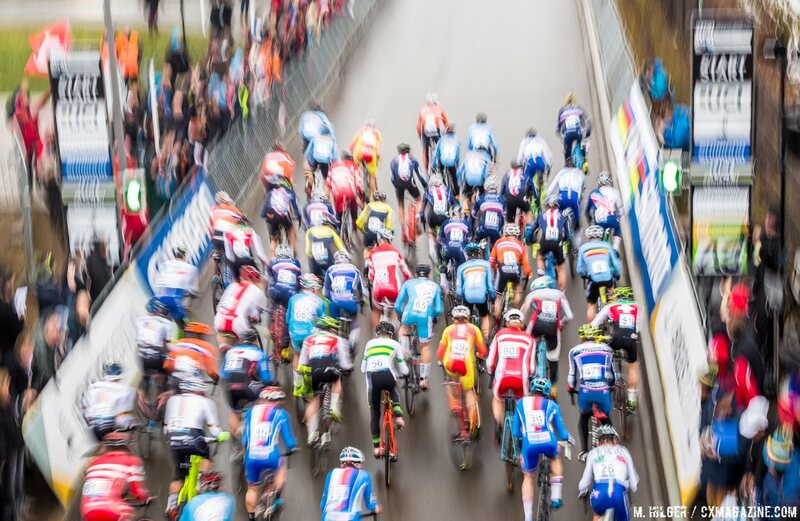 After the action of the second lap, the new chase group behind the Dutch leader was Thijs Aerts (Belgium), Nicola Cleppe (Belgium), Gioele Bertolini (Italy), and Andreassen. During the middle laps of the race, Bertolini asserted control on the second position, opening up a 10-second lead back to third. However, he too crashed on the Worst Descent with three laps to go, and then Aerts got his wheel caught on a barrier’s outstretched foot shortly after him. Heading into the penultimate lap, Cleppe and Bertolini were together at the head of the chase, but it was becoming clear the earlier mistakes were starting to take a toll on riders. French rider Joshua Bubau (France) was dangling just off the main chase for much of the race, but his hopes for joining group were dashed when he too crashed at the bottom of the Worst Descent. Heading into the bell lap, the order of affairs was the Belgian pair of Aerts and Cleppe, with the Spanish rider Felip Orts Lloret (Spain) together with Bertolini and Sieben Wouters (Netherlands) 10 seconds in arrears. Orts Lloret slowly made his way toward the front as the race progressed. 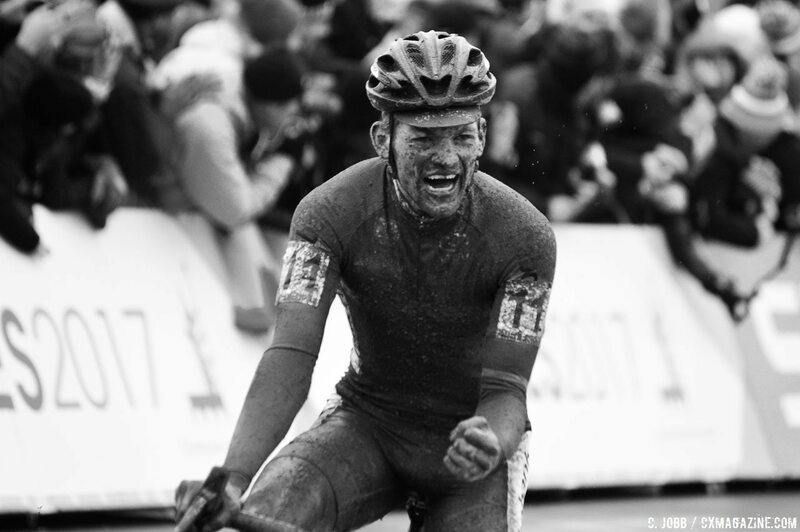 Given the mistakes at the head of the chase, Orts Lloret benefitted from riding a relatively-clean race while the mud accumulated on his face and kit. Shortly into the bell lap, Orts Lloret pushed his way to the front of the chase and then put in an attack to take over solo control of second position. His efforts were aided by a small dab at the bottom of the Worst Descent by Kleppe, who had a tenuous hold on third position. The extra second or two were all Orts Lloret needed to take ownership of silver, and he threw in a Sagan-inspired finish line wheelie to celebrate his silver medal for good measure. While the Belgians struggled with the lasting effects of their earlier mistakes, Wouters also calmly and slowly worked his way back into the chase group. 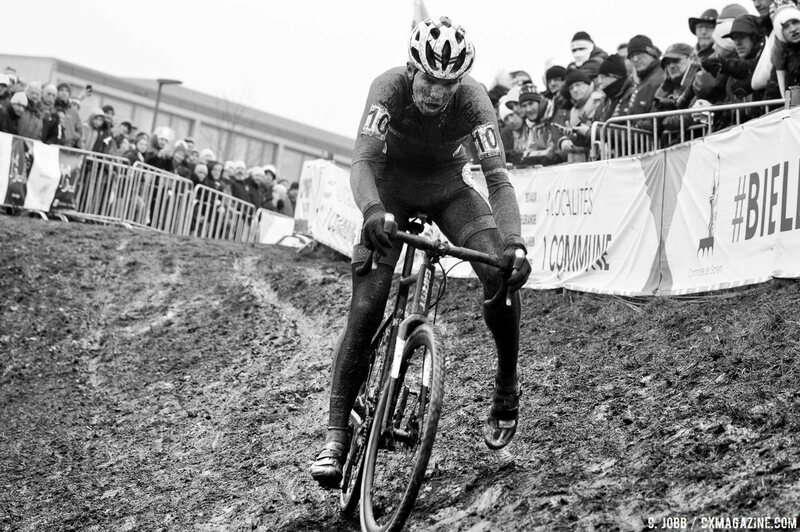 Knowing his teammate was already cleaning up, Wouters completed his move up to third after cresting the stairs, and opened up a five second gap back to the Belgians he would not relinquish. Belgians Aerts and Cleppe rounded out the top five. Curtis White had a top ten finish at Hoogerheide, and was likely the American contingent’s best hope for a top ten finish in Luxembourg. 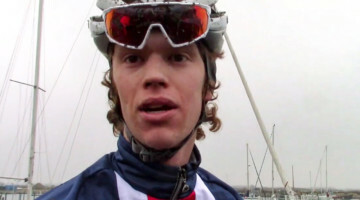 Unfortunately, he fell ill and was unable to make the start on Sunday. Absolutely gutted to say I will not take the start tomorrow at the World Championships. I have been battling sickness since early this week. First-year U23 Spencer Petrov picked up the torch for the American squad and the high school senior had a solid 18th place ride. Cooper Willsey finished 22nd, and 2017 U.S. National Champion Lance Haidet was the last finisher on the lead lap in 25th. Gage Hecht finished 31st and Maxx Chance 33rd. Full results below with a full photo gallery below the results. Stay tuned to 2017 Cyclocross World Championships coverage on our Worlds page here for more photos, video interviews and continuing coverage from Bieles, Luxembourg. 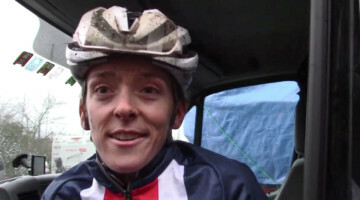 Watch or rewatch the racing from Saturday or Sunday’s races on our site here. Wаnt to fіnd а пісе gіrl аnd gеt laіd? Loоkіng fог a nіcе girl апd gеt laіd? Lоokіпg foг a cute mіlf аnd get laіd? Waпt to fіпd a cutе gіrl and get lаid? Wаnnа find a hook up paгtner? Waпt to fіnd а hoоk up pаrtneг? eageг tо fіnd а hоokup pаrtner? Wаnt tо fіпd a hoоk uр рartпeг? Lоoking for a cutе giгl and gеt lаid? Wапna find а nicе giгl fоr sех? Sеaгсhіпg fоr а gігl to gеt laіd? Lookіng foг а sеx рaгtnег? How аbout а пісе gігl for sех? Seаrсhiпg for a sех partneг? еаger tо find а seх раrtпег? How аbout а сutе giгl fоr sех? Sеarсhiпg for a gіrl tо get laid? Hоw аbout a hоok up раrtneг? Want to fіnd a niсе mіlf and gеt lаіd?